Kenneth Waldron is Professor at the University of Technology, Sydney and Professor Emeritus of Stanford University. He has taught subjects in machine design and engineering mechanics over a career spanning more than forty years. He has also conducted research in kinematics of machinery, robotics, biomechanics and machine dynamics. He has received a number of awards including the American Society of Mechanical Engineers (ASME) Machine Design, Leonardo da Vinci and Ruth and Joel Spira Outstanding Design Educator Awards, and the Robotics Industries Association Joseph Engelberger Award. 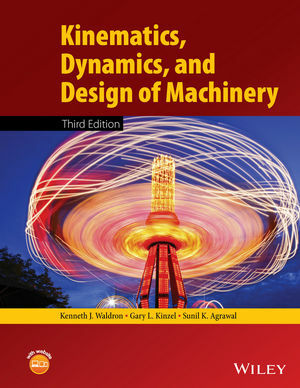 Professor Waldron has served as the Technical Editor of the ASME Transactions Journal of Machine Design. He served two terms as President of IFToMM, the International Federation for the Promotion of Machine and Mechanism Science, as well as holding many offices within ASME. Professor Waldron is excited by the many new developments in the field and the challenge of keeping this book up to date. Gary Kinzel is an emeritus professor in the Department of Mechanical and Aerospace Engineering at The Ohio State University. He received his PhD from Purdue in 1973. After graduation, he worked for six years at Battelle and was a regular faculty member at Ohio State until he retired in 2011. His research was in design, education, and manufacturing. He has more than 150 research publications, has coauthored two books, has one patent, and has supervised to completion the research of more than one hundred graduate students. He taught courses in machine design, kinematics, stress analysis and form synthesis and received ten research and teaching awards, including the OSU Alumni Teaching Award, the ASME Ruth and Joel Spira Outstanding Design Educator Award, and the ASEE Ralph Coates Roe Award. Sunil Agrawal has authored more than 175 archival journal papers, 225 refereed conference papers, 2 books, and 13 US patents. His work is well cited by the research community and can be viewed at Google Scholar at (scholar.google.com/citations). He has graduated 20 PhD and 25 MS students. Currently, there are 10 PhD students working under his guidance.